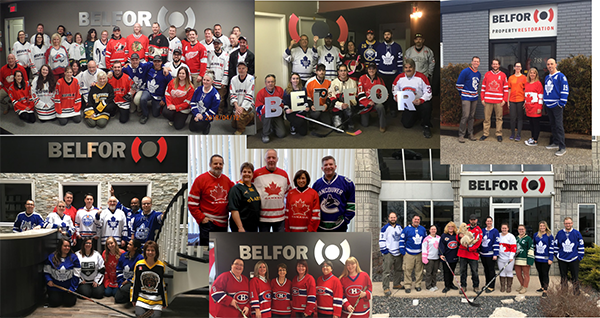 Many BELFOR branches across Canada came together on Thursday, April 12th, 2018, to support National Jersey day in honour of the Humboldt Broncos. The thoughts and prayers of BELFOR offices worldwide are with the players, families, coaches, team management, supporters and everyone affected by this tragedy. Our entire organization offers their sincerest and most heartfelt condolences to the 16 players and staff who lost their lives, and those injured while travelling to play their hockey game in Saskatchewan. Our BELFOR Family wishes you all strength, comfort and resilience through this challenging time. Several donations have been made by BELFOR members across the country to support the impacted families. If you are so inclined, we welcome you to join us by donating to their GoFundMe page: https://humboldtstrong.info/donate/. Any amount can make a life-long difference.